Prostate cancer recurrence after definitive therapy is not uncommon. Recurrent disease is first detected by the elevation of prostate specific antigen (PSA) and may often be radiographically occult. The use of molecular imaging for the localization and staging of recurrent prostate cancer is promising. 18F-Fluciclovine is a synthetic amino acid analog positron emission tomography (PET) tracer which has demonstrated great utility in the evaluation of patients with suspected recurrence disease. Other newer PET tracers such 68Ga/18F-PSMA-ligands are being investigated for prostate imaging with promising results. The purpose of this article is to review the emerging role of fluciclovine in clinical practice for patients with prostate cancer. Since the approval of fluciclovine by the Food and Drug Administration, the modality is widely used in the USA for patients with suspect disease recurrence. 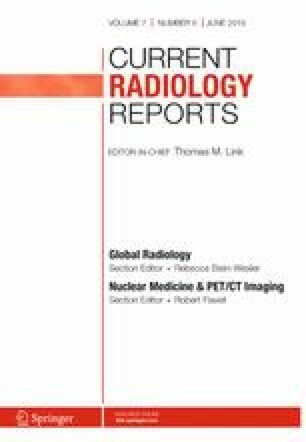 With the coming approval of newer generation of PET tracers, it is important to understand the unique mechanism of action and the diagnostic performance of fluciclovine PET/CT in prostate cancer imaging to allow better allocation of the radiotracers. This review article provides a broad literature review of the current and the future potential role of fluciclovine PET/CT in prostate cancer imaging. Bital Savir-Baruch: Grant sponsored by Blue Earth Diagnostics; Philip, Lecturer. The other authors declare that they have no conflict of interest. Information, A.C.S.M. Key statistics for prostate cancer. 5 Jan 2017;. Accessed 16 Feb 2016. https://www.cancer.org/cancer/prostate-cancer/about/key-statistics.html.